PANAMA S.r.l. 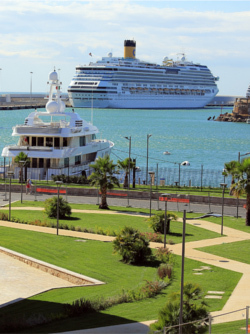 maritime agency has her head office in Civitavecchia. Thanks to the very ancient and well-established experience, she has increased the range of her services and she can provide a complete assistance to Ship Owners covering every branch of shipping areas. Having a deep knowledge of the Harbour rules, habits and uses, Panama S.r.l. provides services of excellence both for tramp ships and liner ones, operating with the maximum respect of the environment, of the quality the service provided, of the safeguard of the health as well as safety and social responsibility. Panama S.r.l., afterwards, has undertaken a way oriented to the implementation of a managing system of quality in respect of the prerequisite of the standard ISO 9001. We can provide bunker supply and relevant delivery logistic to yacht moored at commercial harbour as well as at Riva di Traiano Marina.